The quilt I worked on today has a separate border treatment. As I was working on it and thinking about the Tech Sunday post I had yet to even think about writing. I started thinking about what I do when I work on border treatment. 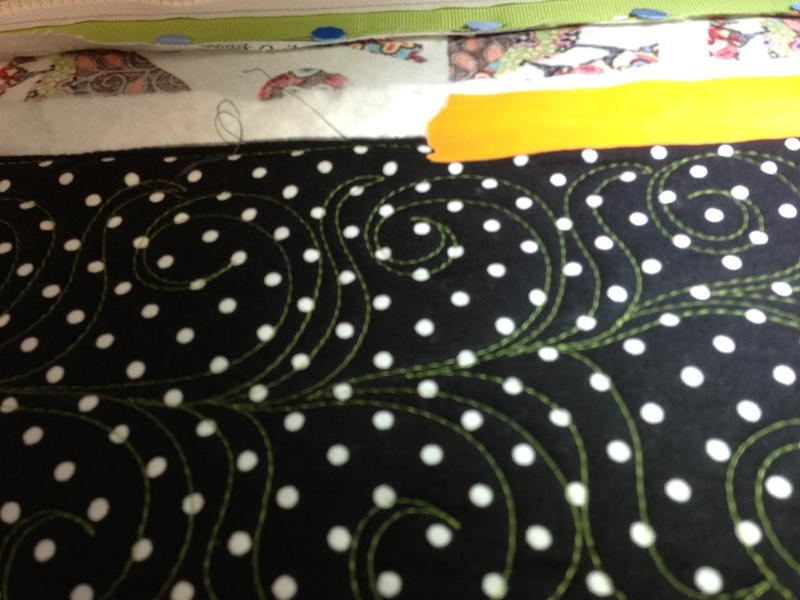 The one I did today had swirls and hook, but I mark it the same why when I do any type of feather border. 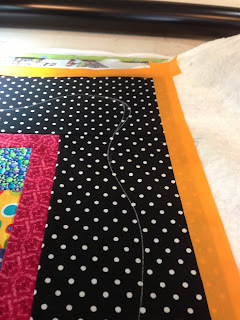 I have seen too many quilts where the quilter did not think about what happens to their feathers if they get the tips too close to where the binding needs to be apply. It makes me sad to see the tips of feathers, that someone worked so hard to learn to perfect, cut off by the binding. To prevent this you have to stop before the edge of the quilt. Sounds easy... but just try it sometime with no marking. Most people naturally aim for the edge of the quilt. I have used chalk and a ruler to mark 1/2 inch in from the edge, but sometimes I miss that white line. Or let's be honest, the chalk bounces off before I get there. My preferred way to mark the edge is with low tack masking tape. 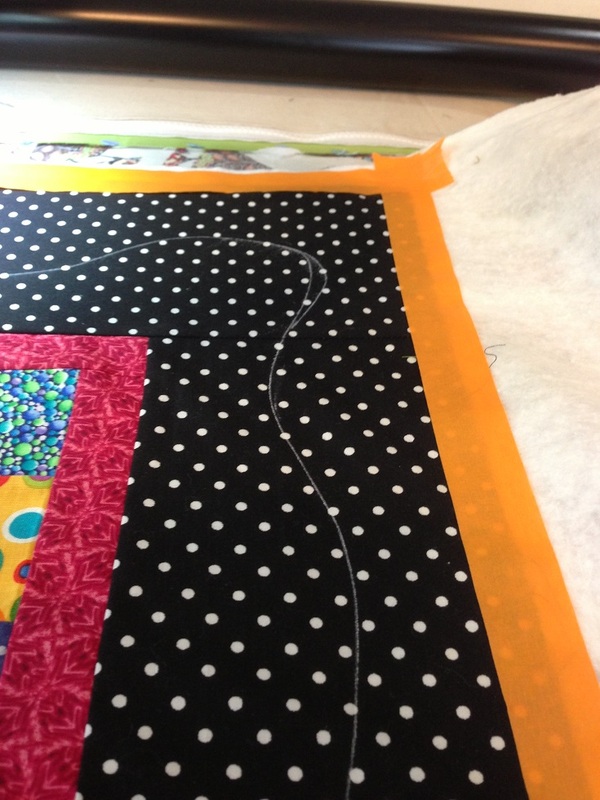 Most of my customer quilts are not super bright fabrics so I love orange masking tape. I have a hard time missing it on most quilts. If I have a quilt that is made from super bright fabrics, I have other colors of masking tape I can use, like light purple. If there is a 12 step program for over use of masking tape, I should probably join. This is much quicker then marking a line. I just rip off a piece of tape and put it down so that the edge is roughly half way into the tape. 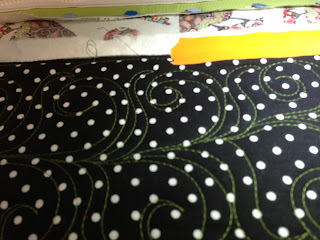 The masking tape is 1 inch wide so that gives me the 1/2 inch with no quilting. I mark the stem quick with a chalk roller. Then I can start quilting. I love things that are quick and work. I use A LOT of masking tape. At least a roll a month. I am totally addicted!